In order for the use of biological carotenoids to become feasible, it is necessary to have adequate low cost sources and improved methods of cultivation. The aim of this study was to evaluate the effect of supplementation with nitrogen, phosphorus, zinc, and magnesium, on the biomass and carotenoid volumetric production by yeast Rhodotorula rubra L02 using a complex medium (sugarcane juice) and synthetic media (sucrose and maltose) as substrates. The experimental design used for each substrate was randomized in blocks with 16 treatments and 3 repetitions. The treatments were compound for 15 different combinations of nutrients (N; Mg; Zn; P, N+Mg; N+Zn; N+P; Mg+Zn; Mg+P; Zn+P; N+P+Zn; N+P+Mg; N+Zn+Mg; P+Zn+Mg; N+Zn+Mg+P) alone and combined, and a control. The results were submitted to analysis of variance and Tukey test at 5% significance level. Among the treatments evaluated, the highest production of dry biomass, with both maltose and sucrose, was observed for Mg (1.60g/L and 1.94g/L, respectively). Additionally, another treatment that stood out in terms of biomass production was the control treatment with maltose (1.54g/L). After the incubation time, killer activity was not observed since there was no formation of inhibition halo around the L02 yeast. Accordingly, there has also been a search for alternatives such as strain improvement, standardization of conditions for fermentation, and identification and characterization of new strains. Thus, the knowledge of nutritional needs of strains is fundamental for microorganism growth and carotenogenesis. The culture medium composition as a source of carbon, nitrogen,5 metals and salts8 needs further investigation focusing on the increase of carotenoids production. The use of low cost carbon and nitrogen sources in culture media has been also seen as a way to make carotenoid production more efficient and viable from an economic point of view. To emphasize the regulation by environmental factors, in many can be replaced by in most, as found in Garbayo et al.6 Furthermore, the rate Carbon:Nitrogen plays an important role in the synthesis of secondary metabolites, determining the type and extent of metabolites synthesized in production. The sugarcane juice substrate is low cost and has high levels of carbohydrate and nutrients, and it is therefore considered as a complex medium. However, the ideal nutrients for biomass production have not yet been defined. Therefore, studies on synthetic medium are necessary in order to identify these elements. Banzatto et al.11 showed that molasses supplemented with urea and Nitrofos KL (Quimatec Produtos Químicos Ltda. ), composed of phosphorus, nitrogen, magnesium, manganese and zinc, stimulated the synthesis of biomass and carotenoid volumetric production. In this way, we used these nutrient sources to prepare a synthetic medium to better know the singular effect of each in the yeast growth and carotenoid production. Therefore, the objective of this study was to evaluate the effect of supplementation with nitrogen, phosphorus, zinc, and magnesium, alone and combined, on the production of biomass carotenoid by yeast L02 using a complex medium (sugarcane juice) and synthetic media (sucrose and maltose) as substrates. It was developed three experiments. The first was done using sugarcane juice as substrate. The second the raw material was maltose, and the third was sucrose. The experimental design used for each substrate was randomized in blocks with 16 treatments and 3 repetitions. The treatments were compound for 15 different combinations of nutrients (N; Mg; Zn; P, N+Mg; N+Zn; N+P; Mg+Zn; Mg+P; Zn+P; N+P+Zn; N+P+Mg; N+Zn+Mg; P+Zn+Mg; N+Zn+Mg+P) alone and combined, and a control. The nitrogen source used was nitrate (2g/L), the magnesium was MgSO4 (0.1g/L), the zinc was ZnSO4 (0.1g/L) and the phosphorus was KH2PO4 (2g/L). All salts used were SIGMA (BR). The yeast used in this experiment, Rhodotorula rubra strain L02, belongs to the collection of the Laboratory of Microbiology of Fermentation FCAV – UNESP, SP. This microorganism was identified by conventional biochemical tests, the RAPD method,12 and the sequencing of the purified 18S rDNA fragment.13 Periodic replication was performed in tubes containing YM agar (0.3% yeast extract, 0.5% peptone, 1% dextrose, 2% agar) and incubated at 8°C. YM medium (yeast medium) pH 5.5–6.0 was used for yeast growth and reactivation. An aliquot of the yeast was collected from a storage tube and inoculated into 120mL of autoclaved YM liquid medium placed on a rotary shaker at 200rpm and 30°C for 48h. Next, cell concentration final was determined using a Neubauer chamber.14 The volume of the inoculum added to each 250mL of the medium was sufficient to achieve a final cell concentration of 107cells/mL. The culture vessels used for mass growth and carotenoid production were 500mL Erlenmyer flasks containing 250mL of each substrate: sugarcane juice (19g reducing sugar/L obtained by the dinitrosalicylic acid method)15 and sucrose- and maltose-based media at a final concentration of 20g/L (2%); the media were supplemented with nutrients according to experimental design described above. The volume of the inoculum added to each 250mL of the medium was sufficient to achieve a final cell concentration of 107cells/mL. The cultures were incubated at 30°C, 200rpm, and 1600lm of fluorescent lighting for 72h. After 72h of mass growth, fermentation was considered complete and the media were centrifuged, the pellet was frozen for subsequent lyophilization, and the TRRS in the supernatant was measured. After incubation the contents of each Erlenmyer flask were subsequently centrifuged (Himac CR 21G-High-Speed refrigerated centrifuge-Hitach, BR) at 15,000×g at 25°C for 10min. 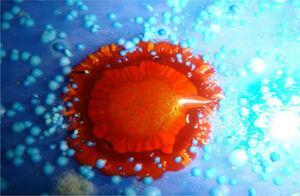 The pellet was resuspended in 10mL sterile deionized water. The yeast mass was frozen using liquid nitrogen and then lyophilized using a refrigerated centrifuge (Savant Super Module) for 48h to obtained a sample dried. These samples were weighed in a balance Miller to obtain the dry mass. The dry biomass was ground in a porcelain mortar with a solution of Celite (Sigma, BR) and acetone at 6°C.16 The mixture was then vacuum filtered in glass funnel with a sintered glass disk. This procedure was repeated until it no longer exhibited the characteristic color of carotenoids. The ketonic extract was transferred to a separation funnel containing 50mL of petroleum ether (Sigma, BR). The mixture was slowly washed with 900mL ultrapure water. This procedure was repeated three times. Anhydrous sodium sulfate was used to dry the non-polar phase, and the pigments were concentrated on a rotating evaporator (<35°C) to a volume of 6mL. These procedures were performed under low lighting conditions. The total carotenoids determination was made according Davies,17 using a spectrophotometer in a wave-length 450nm with a absorption coefficient=2500 in petroleum ether. From the results obtained for total carotenoid concentration and dry mass of yeast, was calculated the yield of carotenoid produced per gram of dry biomass. The killer activity of the strain L02 was determined using two sensitive yeasts (Candida glabrata Y55 and Pichia kluyveri CAY15) that were inoculated onto a Petri dish contain YEPDMB medium (yeast extract 10g/L, glucose 20g/L, peptone 20g/L, agar 20g/L, methylene blue 0.03g/L, buffer pH 4.0 with citratophoshate 0.5M) according Sangorrín et al.18 Two Saccharomyces cerevisiae killer strains that produce and secrete protein toxins (K1 and K2) lethal to sensitive strains were inoculated in a different Petri dish. The supernatant resulted from centrifugation was collected for TRRS analysis using the dinitrosalicylic acid – DNS method.15 A standard curve was constructed using known concentrations of glucose (200–2000mg/L) by plotting the absorbance values at 575nm and their corresponding concentration. Yeast R. rubra strain L02 grew and biosynthesized carotenoids in sugarcane juice and in sucrose- and maltose-based synthetic media. Among the treatments supplemented with nutrients, the highest production of dry biomass (Fig. 1), with both maltose and sucrose, was observed for Mg (1.60g/L and 1.94g/L, respectively). Additionally, another treatment that stood out in terms of biomass production was the control with maltose (1.54g/L). On the other hand, the synthetic medias supplemented with Zn, alone or mixed with other nutrients, results the lowest production of dry biomass. 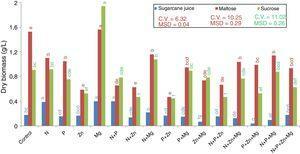 The treatments N+P+Zn+Mg and P+Zn+Mg did not result in the lowest dry biomass using maltose substrate. Dry biomass produced by R. rubra strain L02 in sugarcane juice and synthetic media. Mean followed by the same letter in each substrate source are not statistically different from each other (Tukey test 5%). DMS – significant deviation min. CV – coefficient of variation. 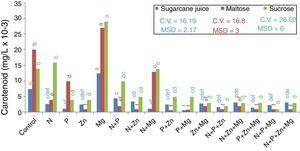 As for the treatments with sugarcane juice as a substrate, the treatments N, Mg and N+P resulted in the highest dry biomass, and that with P+Zn+Mg resulted in the lowest dry biomass. 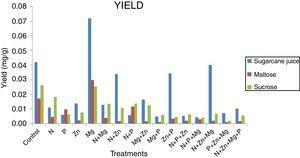 The treatment Zn+Mg also results in the lowest dry biomass. Maldonade et al.21 carried out studies with the aim of maximizing the production of carotenoids by R. mucilaginosa strains isolated from the Brazilian ecosystem with the variables pH and levels of glucose, yeast extract, MgSO4·7H2O, and KH2PO4. The results indicated that carotenoid formation was more sensitive to changes in the yeast extract concentration than to changes in glucose concentration. El-Banna et al.2 carried out studies with Rhodotorula glutinis and found that this strain produced 7g/L dry biomass, 266μg/g cellular carotenoids, and 1.6μg/L volumetric carotenoids, and that it contained 12.4% lipids after growing in a yeast malt broth under shaking (100g) at 30°C for 4 days. The behaviors observed are related to the fact that yeasts require minerals that act as functional components of proteins, as enzyme activators, or as protein stabilizers. According to Morris,22 although some mineral compounds may not be required for yeast propagation, they can stimulate its growth. From the results obtained, it can be observed that magnesium stood out in terms of optimization of dry matter production by the yeast. Magnesium stimulates the absorption of H2PO4−, maintains the membrane integrity and permeability, regulates the divalent cation transport, and influences enzymatic activity and the structure of organelles in a cell.23 However, the other nutrients added did not have the same effect suggesting that the control treatment with YM provided the basic nutrients for yeast multiplication. This explanation could respond the behavior of sugarcane juice fermentation, which is a complex medium and presents a high concentration of these same elements. Costa et al.24 obtained for sugarcane juice the concentration of 50–130mg/L calcium, 500–2000mg/L potassium, 20–80mg/L sodium, 140–150mg/L magnesium, 4mg/L manganese and 5mg/L iron. In this way, we could infer that the elements in the juice affect the biomass production by R. rubra, but is important highlight again the action of magnesium, once increased the level of dry biomass. Quantification of carotenoids using the absorption coefficient of 2500 in petroleum ether, absorbance at 450nm, and DAVIES, 1976s formula. Tukey test at 5% probability, mean followed by the same letter in each substrate source are not statistically different from each other (Tukey test 5%). DMS – significant deviation min. CV, coefficient of variation. The lowest carotenoid production in the maltose-based treatments was found for the treatment supplemented with P+Zn (0.0007mg/L); in the sucrose-based treatments, it was found for the treatment supplemented with N+P+Mg (0.0018mg/L), and in the sugarcane-based treatments, the lowest carotenoid production was found for the treatment supplemented with Mg+P (0.0005mg/L). Therefore, it seems that despite the role of nutrients in yeast metabolism, either alone or combined, they do not favor the production of biomass and carotenoids, except for magnesium. Thus, it was found that Mg was the nutrient that influenced the increase in the biomass dry weight and carotenoid concentration for the substrates studied: maltose, sucrose, and sugarcane juice. In studies on R. rubra, using molasse supplemented with urea, Banzatto et al.11 found a volumetric production of carotenoids of 2.50mg/L; Shih and Hang25 cultivating it in agroindustrial waste (white cabbage fermentation), found the maximum yield of total carotenoids (1.04mg/L). Probably the low concentration of carotenoid obtained in this study could be associated a characteristics of the media used. The synthetic medias is a poor substrate for the growth of the yeast, and the sugarcane juice could has contain much elements, wich decrease the produce of this biomolecule, as observed for dry biomass. According to Chanchay et al.,26 the optimum culture conditions for the carotenoid biosynthesis by R. rubra are 10g/L of glucose as carbon source, supplementation of 1g/L ammonium sulfate as nitrogen source, and 1g/L of yeast extract as the growth factor, which produced the best yield of carotenoid content, 30.39mg/g dry cell weight. It can be seen that in terms of carotenoid concentration (mg) versus dry biomass (g) the pigment production yield (Fig. 3) was the highest for the sugarcane-based complex medium supplemented with magnesium (0.07mg/g), followed by that of the sugarcane juice control treatment (0.04mg/g). It was possible because the yeast showed low concentration of dry biomass and high of carotenoid, but the quantity of carotenoid produced was higher for sucrose and maltose medium. Investigating the potential of Sporidiobolus pararoseus as a source of microbial carotenoids using agroindustrial byproducts, Machado and Burkert1 found carotenoid production of 4.78g/L/h (0.55μg/g/h) and biomass production of 0.04g/L/h. Results of the yield of pigment production in the 3 substrates analyzed (sugarcane juice, maltose, and sucrose). Despite of the low carotenoid production using sugarcane juice, it is important research new raw materials for this industry, because currently the factory uses synthetic medium that presents high cost, increase the price of the pigments in the market.1 From the results obtained in this study, is interesting evaluate the use of commercial sugars, as crystal, refined, very high purity (VHP) and very, very high purity (VVHP), because they contain majorly sucrose. Yeast strain L02, after the “killer” test, grown in buffered-YEPD methylene blue medium (citrate phosphate buffer) at pH 4.5–4.7 and 22°C for 10 days. The last step quantified the TRRS in the wine. The results are showed in Fig. 5. It was found that the maltose-based treatment with the highest sugar consumption was that supplemented with Zn (1.2g/L), and the one with the lowest sugar consumption was that supplemented with N+Zn (4.1g/L) this value is remaining sugar in the medium after 72h of incubation. In the sucrose-based treatments, the one with the highest sugar consumption was that supplemented with Mg (0.7g/L), and the ones with the lowest sugar consumption were those supplemented with N+P (1.7g/L) and P (1.6g/L). TRRS of the supernatant collected after centrifugation in the treatments with the 3 substrates used (sugarcane juice, maltose, and sucrose). Mean followed by the same letter are not statistically different from each other (Tukey test 5%). DMS, significant deviation min; CV, coefficient of variation. 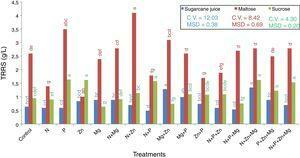 In the treatments with sugarcane juice as the substrate, that supplemented with N+Zn+Mg (1.3g/L) was the one with the lowest sugar consumption, and that with N+P+Mg (0.5g/L) was the one with the highest sugar consumption. Therefore, it can be said that there is no relationship between biomass production/pigment concentration and the use of sugar by the yeast, indicating that the sugar available can serve different functions in each case. We can infer that the yeast R. rubra could be used the sugar for acid, glycerol, quinones, hopanoids, polyterpenes, dolichols production, for example, because they are formed during the metabolic route for carotenoid production in yeasts. The route begginig convertin the glucose in Acetyl-CoA; the next step is transformed it in Mevalonate by HMG-CoA reductase. The Mevalonate is converted in isopentenyl pyrophosphate (IPP), dimethylally pyrophosphate (DMAPP), dimethyl pyrophosphate (GPP), farnesyl pyrophosphate (FPP), geranylgeranyl pyrophosphate (GGPP) and finally, in carotenoid. The most secundary compounds is produced for FPP and GGPP.28 In this context, future experiments are necessary to determine the substances produced by this yeast. It was concluded that the use of nitrogen nutrients and magnesium using maltose or sucrose as a carbon source in the culture medium resulted in the highest carotenoid production levels since they increased the dry weight and carotenoid volumetric production by strain L02. However, the use of zinc is not recommended since it resulted in lower carotenoid production. With regard to the killer activity, the negative result indicates that this yeast can be used as a potential antioxidant in the food, pharmaceutical, cosmetics, and chemical industries. Effect of carbon source on carotenoid production by Rhodotorula sp.